Video poker is something we’ve all dabbled in every now and again and, rather like Marmite, one tends to either love it or hate it. Jackpot Poker is Play N Go’s addition to the video poker line-up and while it’s looks are arguably rather basic it does come with a progressive jackpot to liven up proceedings. Read the full review below and find out how to qualify for the big bucks. 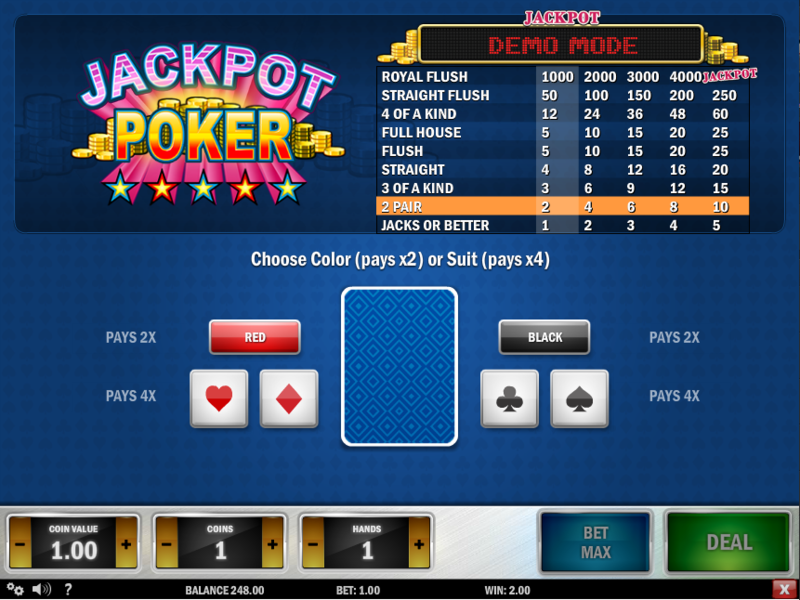 Jackpot Poker is a fairly basic-looking rendition of video poker that would probably suit beginners; five massive cards face you when you load the game up and the paytable sits just above with the progressive jackpot total right at the top. The aim of video poker is to gain the best possible hand according to standard poker rankings with two draws. Following the first draw you can hold whichever cards you wish in the hope of making a winning hand. Firstly select your stake using the ‘Coin Value’ and ‘Coins’ buttons below the reels to give a betting range of £1.00 to £5.00. Now press ‘Deal’ and your first five cards will be revealed; hold any you think are helpful (or let the game hold the optimal cards automatically) and then press ‘Deal’ again for the second draw. This is your final hand so by now you know whether you’ve won or lost. Jackpot Poker is a ‘Jacks Or Better’ version which means the lowest winning hand is a pair of jacks. Each win can be gambled or collected and if you decide to gamble you get to play a card guessing game in which you can double or quadruple your win by picking the correct colour or suit. There’s a limit of five correct guesses or 1000 coins. 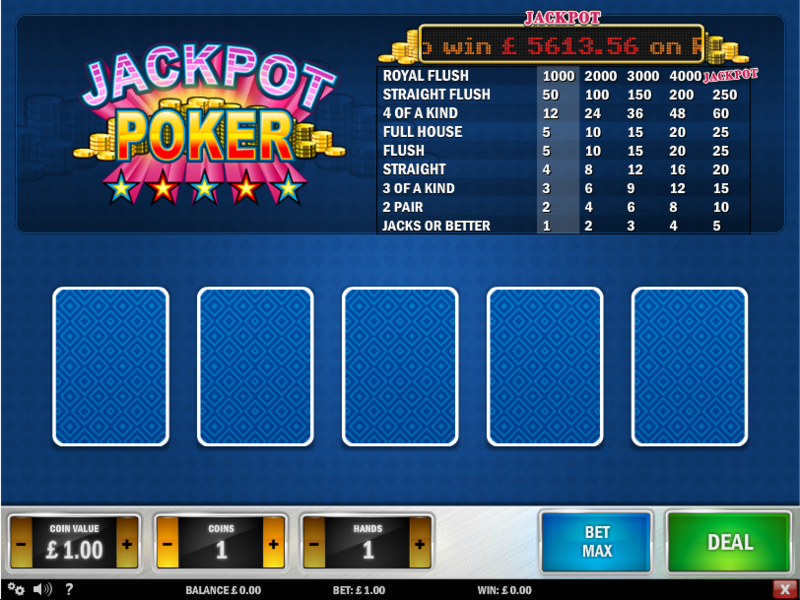 The jackpot total is shown above the reels and the way to win it is to land a Royal Flush (10, J, Q, K and A of the same suit) while playing the maximum bet level of £5.00. Jackpot Poker would be a little but run-of-the-milll if it weren’t for the addition of the progressive jackpot and to some extent the gamble feature (although we don’t generally recommend using this). Using the best strategy the RTP is 91.30% or 95.30% with the maximum bet. For optimal gameplay, check out our video poker strategy page.